Poluttamo-hankkeen tavoitteena oli kehittää menetelmiä oppimisen ja opetuksen visualisointiin sekä luoda uudenlaisia menetelmiä lähestyä haastavia tai aikaa vieviä ohjausprosesseja. Hankehakemusta kirjoitettiin vuosina 2014-2015, jolloin mobiilipelit muun muassa Angry Birds ja Clash of Clans olivat vahvasti lyöneet itsensä läpi kautta kaikkien ikäluokkien. PokemonGo räjäytti pankin kesällä 2016 hankkeen jo alettua. Lisätty todellisuus tuli jokaisen älypuhelimeen pelin kautta ja avasi ymmärryksen, mitä se voisi olla ja millainen potentiaali mixed realityllä tulevaisuudessa on. Perusopetuksen opetussuunnitelmauudistuksen yhteydessä puhuttiin paljon pelillistämisestä ja pelien vaikutuksesta oppimismotivaatioon. Lähtökohtana pidettiin, että pelillisyys lisää motivaatiota. Poluttamolaiset lähtivät korkein odotuksin miettimään, miten yhdistää oppimisanalytiikka, pelillistäminen, visualisointi, oppimisen kokemuksellisuus ja miten ehkä tätä kautta tukea opiskelijaa kasvamaan aktiiviseksi oman oppijuutensa kehittäjäksi. Tarjaleena Tuukkanen esittelee videolla Microsoftin syventävää lukuohjelmaa, joka mahdollistaa tekstitiedostojen kuuntelemisen ja sisältää myös lukuisia tekstin luettavuutta lisääviä toimintoja. Otavan Opiston Kari A. Hintikka vieraili Digituikku-hankkeen webinaarissa 19.11.2018 esittelemässä Poluttamo-hankkeessa tehtyä itsearviointi- ja elämänhallintasovellusten katsausta: Digituikku – älyvekottimien ja sovellusten hyöty? Article first published on SeOppi 2/2018. Working in the Adaptable Learning Paths project gets me to reminisce about my own study years. The topmost issue that comes to my mind from upper secondary studies is my friends – the bubbly characters as well as the more reflective personalities. Going in, with wobbly legs, to take that first test of our matriculation examinations… The approving encouragement from peers, felt by the entire group of us students, forms an empowering experience that stays in my mind. “We’ll manage. We’ll pass at least”. Upper secondary studies form a comprehensive phase in a student’s life in which it is important not only to acquire learning but also to establish networks with fellow students. During studies, it is necessary that we are allowed to take time for our personal formation processes, wondering about our own paths, tasting the different options and possibilities. On our study paths, we reach for our dreams but we also stumble; we work at fitting ourselves into our groups at school, into work placements and into our professional reference groups. We grasp at the future, aided by the staff in our school and supported by our peers. Even though peer relationships usually grow naturally and little by little in our daily student life, it is important that educational institutions support that growth. The Adaptable Learning Paths project was a joint effort by the educational association Citizens’ Forum, Hämeenlinna Lyseo Upper Secondary School, and Omnia – the Joint Authority of Education in the Espoo Region, in which the parties developed a method for peer-coaching. Peer-coaching is based on encounters that involve action, dialogue and respect, and its purpose is to offer comprehensive support for students for their coping and progress in studies. Peer-coaches are individuals trained from among the students and staff at school, both young people and adults. The themes in the work with peers are not limited to progress in studies and students may bring up other issues they feel important. Such issues may include e.g. the significance of hobbies, daily routines and personal relationships for keeping up the motivation to study and for living a meaningful life. In an ideal situation, we all would have the chance to shine, be seen and be heard as the persons we are. Peer-coaching brings experiences of success into our reach. We are all capable of listening to another person with respect, encouragement and support for the other’s strengths, provided that we are given sufficient time and a safe place. I hope that very many students get a happy, flying start toward their adult lives, feeling the same warmth I did when the student cap was set on my head: “We really did it – we managed, we succeeded together”. The material Together on study paths – peer-coaching in upper secondary level [Yhdessä opiskelupolulla – Vertaisvalmennus toisella asteella] presents the work method applied in peer-coaching and gives practical suggestions for initiating such coaching in upper secondary schools. The guide is intended for teachers, career counsellors, study counsellors, workplace instructors and dormitory supervisors in vocational and general upper secondary education. It also serves as learning material for students in training for peer-coaching. Students at Universities of Applied Sciences feel they need to acquire the competences required for managing their web identities, for marketing their skills, and for building their expertise online (Kopeli 2018). One of the objectives of HAMK University of Applied Sciences in the Adaptable Learning Paths project was to help individuals demonstrate their competences through the development of their digital portfolios; the work on portfolios was emphasised particularly with groups who were at the beginning of their studies. The idea is for students to start their portfolio work at the beginning of their studies and to keep it up throughout studies, receiving continual support. There is an awareness of digital portfolios, but they are not commonly used for comprehensively compiling evidence of competences during studies. When health care students were asked about their earlier experiences of portfolio work, approximately 40% had actually compiled a portfolio, and of those, only 16% had done it completely or partly digitally. Those portfolios had been compiled as parts of individual courses and study modules but not been made use of afterwards. 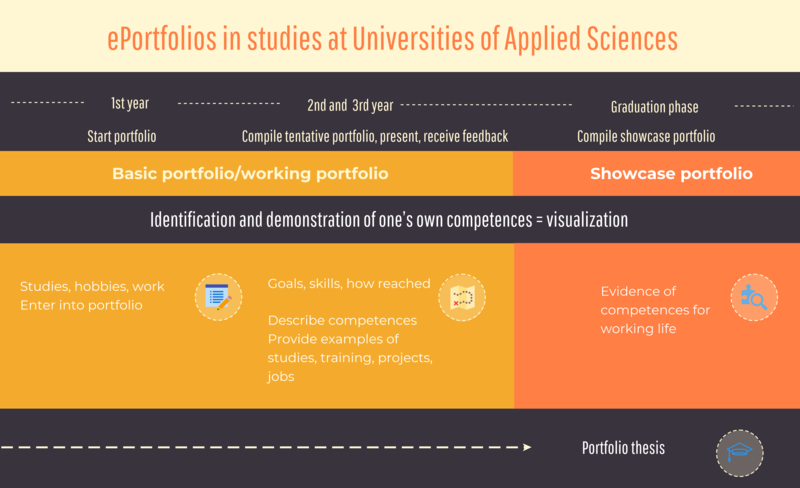 Some students had compiled portfolios on their professional growth and used them in jobseeking. The elements they had included consisted mainly of text and images; however, some individual students had included videos and blogs. To support students in their portfolio work, we asked them what kind of support they felt they needed. For some of them, portfolios were a novel concept, and they felt they required help with “everything possible”. Some hoped to have one simple place in which to compile the portfolio as well as guidance in the use of the various software. The greatest amounts of support were wanted for describing the concrete skills involved in one’s own learning and for the use of the selected portfolio service. To build their portfolios, students were also interested in making use of various tools such as Padlet, Sway, LinkedIn and MS as well as infographics and blogs. Our workshops were organised under the themes Portfolio – what, when and how; The ePortfolio service Kyvyt.fi in the structuring of your portfolio; Making use of O365 services; Easy visual tools; Using blogging services; Creating a LinkedIn profile, and Using the Open Badge Passport service for receiving and storing Open Badges. The workshops involved concrete planning and compilation work on portfolios, and students were asked in advanced to bring in material that showed their competences – CVs, pictures, video clips, certificates. The feature in common for the workshops was deliberation: discussions about the identification and demonstration of one’s own competences and the options available for structuring a portfolio. There were ready-made questions to assist in e.g. the consideration of what a student’s competences consisted of, how the student might recognise and describe them, how to collect evidence of learning and how to make use of the portfolio during studies. Students wished for instructions from their teachers concerning the limitations on their fields due to various statutes and considerations of ethics, copyright and data protection. They hoped that portfolios would form a routine part of their studies so that their work on their assignments would produce portfolio materials, the work would be conducted together, and feedback would be regular throughout studies. Portfolio ownerships lie with the students, and students should have the opportunity to select such tools for themselves that they themselves feel suitable. The work on portfolios falls on different academic years and it is guided by several different teachers and the study advisor as agreed for the type of degree programme. At the end, the outcome of a student’s work may be a thesis in the form of a portfolio. Times of day, submission dates, learning statistics, interaction charts – is this what is meant by “learning analytics”? Leena Vainio studied for the Adaptable Learning Paths project what learning analytics tools are available in current electronic learning environments and how they are used. She received responses for her survey from the representatives of sixteen system suppliers, three learning material producers and six educational institutions. For quite some time, learning environments have shown us statistics on the use of the system and materials. Such information has been essential for pure online courses, and particularly so for their development, whereas the same information has often been only nice-to-know for classroom teaching. However, learning analytics comprise much more than learning statistics. We use learning analytics to combine bits of information in order to bring up the critical issues that affect the learner’s progress – the learner may remain completely unchallenged or he or she may be struggling with assignments which are much too difficult, or the situation may be somewhere between these extremities. At its best, learning analytics support the learner in a timely fashion and guide the learning process towards its goals. Learning analytics alone cannot support learning, and the support of teachers, other learners, parents and workplace instructors is much in need. Analytics provide information that helps the parties think together and find the relevant strengths and points to develop. Properly used, analytics help teachers by giving them new methods to guide learning processes and to support individual, unique learning paths. The true value of learning analytics is seen when we can use them to help students understand their own ways of learning. How do their own efforts show in the progress of their studies? How have various interactive situations influenced their learning? Active learners could select their next step independently in accordance with their interests from among materials offered by the teacher or an artificial intelligence. Is a task best done alone, or would learning be easier through peer learning? Will knowledge grow best if the student works alone, or together with someone else? Most often, electronic learning materials are put together by individual teachers and the same teachers decide which materials they wish their students to turn to next. Adaptive collections require very different levels of learning materials in order to cater to the needs of different types of learners. Individual teachers working alone are far from being able to make their materials collections adaptive, but by combining forces and working together, they could make versatile materials and exercises more quickly and for varying situations. The survey showed that there is no onestop-shop application available. The systems all have their strengths, and combining them according to the situation might bring the best results. It is good if we try out different ways, talking to one another about what we actually look for. Most importantly, we should consider what we intend to do when our analytics highlight a problem. What is our action plan? What are the resources for us to tackle the problem? When can the teacher, working alone, provide support, when do we need counsellors and other support persons, and when do we need an artificial intelligence? Just as we need different learning materials and exercises for different learners, we need different guidance methods for different situations. We need multidisciplinary support teams to help an individual teacher, formed dynamically according to the circumstances. The novel feature in current learning analytics is the way they make the possible problem spots visual for learners themselves. Learners obtain a better picture of the total situation. In learning analytics -based pedagogy, it is more important than before to agree on the goals with each individual learner. What will we practice next, and why? How will we apply this learning later? We start to build knowledge together and select the necessary tools together so that we may reach the goals. The General Data Protection Regulation GDPR poses certain challenges for the use of learning analytics, but with the appropriate authorisations, we may collect and use data. We might even take sleep and activity data from smart watches and compare them to learning outcomes. Our smart watch might suggest that we take a nap today in the early afternoon so that the Swedish class later in the afternoon would go better. Would that be learning analytics or wellbeing analytics? Our concluding statement after the survey is that the development of learning analytics will require a great deal of national-level discussion. Similarly to the debate on artificial intelligence, learning analytics as well require a unified understanding of the concept of human being which we wish to help formulate. What views do we adopt regarding diverse learners and how do we apply the different guidance resources available to us? At the same time, we also need a shared understanding of the minimum which learning analytics should show us. What features should be available in all systems? What are the minimum requirements; what requirements do we have for data transfer among different systems; what interfaces and registration systems should we use? Recognise the need. What are the problems to be solved through learning analytics? Specify. What kinds of learning analytics do we already have in our school? What do we need? How does the analytics system impact our work culture and management? What conceptions of learning and human beings are supported by the analytics system? What skills do we need? The staff’s competences and their training. How do we share responsibility and adhere to all legal and ethical requirements? What technologies do we need? How do we process data, in which forms, and to whom do we disseminate the information? How do we carry out development actions? How do we monitor the outcomes? How do we maintain and enhance the system? Do we, without fail, hold the learner’s best interests as our highest priority? After three years, the Adaptable Learning Paths project has reached its final moments. At the same time, Finland’s reform of vocational upper secondary education is in full speed. It is time to sum up where we are and invite educational institutions all over the country to benchmark the Adaptable Learning Paths model. In that model, we make contents available for students to learn independent of place, which allows greater flexibility regarding where to start and conduct studies. Students who complete their degrees while working benefit from this, as do those who obtain their learning in educational institutions with ample support from teaching staff through contact guidance, and so do even those who are not always able to come to school but learn independently in their homes under distance supervision. Our assignments combine practical learning and theory, thereby guiding students to observe, document and reflect on their own learning and to link each assignment to the required background information. The learning and practice of professional terminology, keenly desired by teachers, takes place while completing assignments. Over the past years, we have enhanced our way of thinking about digital support. In the early years of social media tools, many teachers were confused in the jungle of applications and IT managers gritted their teeth confronted with support requests for a multitude of freeware applications. Today, the emphasis placed on individual learning paths in the current education reform drives us to include the various computer systems of educational institutions into the students’ digital paths, thereby enabling the students themselves along with the teaching staff and study advisors to follow the progress of students’ acquisition of competences. In addition, we desired to retain the years-old requirement of compiling a portfolio. Portfolios were first compiled in Blogger, then in Instagram or Pinterest, with the idea that they would help students obtain employment. This is also in line with the reform: students should be guided in overall career planning, and providers of education are rewarded if their students find employment or further education places. In the spring of 2018, the steering group of Tavastia Vocational College decided that over the upcoming years, our organisation would implement outcomes of the Adaptable Learning Paths project in the Moodle environment. It is important that the pages for the various qualification units are visually appropriate, uniform and subdivided in accordance with the subdivision of vocational competence requirements in the student management system. To achieve this, we created Moodle templates for qualification units and compiled sample assignment structures on these templates, and, in order to systematically monitor the progress of students’ acquisition of competences in a visual manner, we set our assignment monitoring tool on automatic monitoring. During the school year 2018 – 2019, we will phase and support the introduction of this system, assigning responsibilities in and among teams so that no-one will be required to be a nerd in order to get started. We are also building a connection between students’ Moodle and Wilma: when a teacher has approved, for a student, all assignments and check points under a certain qualification unit in Moodle, information about that student’s readiness to proceed to skills demonstration is automatically forwarded to the student’s personal competence development plan in Wilma. Even though we operate in a closed school environment, the teaching staff is encouraged and even instructed to continue the use of a variety of digital applications and essential professional literature in the digital form – as long as security issues are in order. The first field to start the creation of assignments in Moodle following our system and in accordance with the new qualification requirements is Upholstery and Interior Decoration, a qualification under Industrial Arts. We encourage other field-specific teams to adopt this model and to draft long-term development plans in Moodle, incorporating a wide variety of multimodal and embedded contents such as photos, audio, video, third-party learning materials, structuring tools, examination tools and game tools. Initially, we allow basic user functionalities to teachers. We also eagerly await the opportunity to use the national solution for open-access learning materials, of which the ministry informed the public in October 2018. In the Tavastia system, the front pages of courses correspond to qualification units and are standardised. Behind the pictures on the front page in Moodle, there are vocational competence requirements structured in modules in the same way as in students’ personal competence development plans in Wilma. Each blue block in the coloured bar “Osaamisen kehittyminen” [Development of competence] changes to green when the student completes that module. Underneath, the bar “Tehtävien seuranta” [Assignment follow-up] indicates the completion and approval of individual assignments. It is important that students have coherent study processes and digital support available before they enter work placements in new work communities. Such support enables them to concentrate on their learning opportunities while they are in working life: how do you operate in this work community, how do you master the skills specified in the formal competence requirements, etc. The structures and schedules of the teaching arrangements in a school impact the usability of our model. The Adaptable Learning Paths project pilot operator, the Surface Treatment Guild, has implemented a system in which each student’s schedule reads ”Vocational qualification units” from 8:10 am through 2:30 pm each day. In this way, the issues to be learned depend on the practical work originating from current customer assignments and other similar sources, and the student determines, under the teacher’s supervision, what skill it is that the job improves. Teaching at the Surface Treatment Guild focuses on skills that help students accumulate the competences specified in the formal vocational competence requirements. The Guild also annually offers in-depth theme days in which everyone is invited irrespective of formal qualification as long as they desire to improve their skills in that vocational field. Opposite to the mainstream opinion in the media this autumn, we think that students are still able to obtain learning through their vocational education; however, this requires that we let go of the old structures, fully embrace the opportunities offered by digitalisation, and make sure that teachers have the required competences themselves. We must also ensure that if a student is unable to handle his or her study duties at the workplace or home, then that student is pulled back into the classroom into the teacher’s solid, supportive care and helped to complete those tasks which the other students are doing at the workplace. At the same time, we must ensure that the teaching staff have a sensible amount of time allocated per duty and make sure that it is possible to organise tasks in teams so that students may feel that their teachers are available and students also gain sufficient practice for true competence. In the final moments of the Adaptable Learning Paths project, we will publish a more detailed digital support model, and we also hereby invite teaching staff and school administrations to come visit us in the upcoming years and learn about our development work, which will continue even though the project will be ended. Come and see us at the Adaptable Learning Paths project final seminar on 21 November 2018 in Helsinki and 27 – 28 November 2018 in Jyväskylä at Arena for Digital Learning. The Adaptable Learning Paths project is nearing its end. We are collecting lessons learned, thoughts and even misses from our trail. The sense of community, trust and sharing in this inspiring and inspired team have, in many areas, opened the opportunity to reach something that was, initially, totally unexpected. The objective of the project was to support upper secondary students as they clarified their study paths, progressed in their studies and grew and developed professionally. The project made use of digital footprints, the many opportunities brought by learning analytics and visual, personal study plans as well as methods of peer mentoring and peer coaching. The objective was to help those students who were in the danger of dropping out or had recently dropped out so that they could move forward on their study paths and fluently complete the transition to another school, another level of school or to working life. The project was funded by the European Social Fund. As we compiled the project’s outcomes and outputs, our discussion brought up how greatly the world around educational institutions has changed. The road from the planning to the final report is a long one. The planning of the Adaptable Learning Paths project started in 2014. It is impossible to foresee the extents and impacts of all different changes on the original project plan. Science, research, legislation and statutes change and develop. They have done so during the Adaptable Learning Paths project to even a greater extent than before. Digitalisation and the changes in the world are also seen in the reforms of the educational sector. All curricula have been renewed; the reform of Finland’s vocational upper secondary education with its qualifications reform has proceeded into its implementation phase; funding models have been changed; and the entrance examination changes and student selection criteria reforms for higher education institutions will be implemented phase by phase starting in 2019. The national Study Credit, Degree and Qualification Disclosure Service Koski and the General Data Protection Regulation GDPR ensure plentiful work for IT departments while mould-ridden school buildings and other problems weigh on all involved parties. The educational sector has been busy indeed. On the other hand, the swift rate of change has caused a backlash. More and more, people want face-to-face meetings – they desire to have a physical community in which they can belong. Focusing on wellbeing and investing in oneself have become acceptable, and the sharing of personal experiences has become more and more common. The Citizens’ Forum sees this, for example, in the filling up of their creative writing courses. The variety of ongoing changes is so comprehensive that our traditional support networks are no longer able to help visualise upper secondary students’ paths. Versatile support is needed. The following articles discuss the methods developed under the Adaptable Learning Paths project to clarify students’ personal digital learning paths in today’s environment. We wish to thank the project’s steering group and all project members as well as all other involved parties for their efforts in this rewarding work. As roads go, this is not the end but the first few metres.